Whether you are designing a laundry room for a new home, remodeling your current space or just looking to refresh your laundry room's look, inspiration can come from just about anywhere. Here are 50 diverse laundry rooms each offering some great stylish components. One easy way to create a modern look is to add a new light fixture. It's an inexpensive way to start a design or up your laundry room's style. Continue to 2 of 50 below. The designers of Arch Studio choose a French Country style for this classic U-shaped laundry room. The room features cabinets galore with easy to clean countertops at two levels. The room has plenty of light and a convenient hanging rod for clothes. The most unique feature is the rich blue paint is carried from the walls up onto the ceiling for a custom look. Continue to 3 of 50 below. All of the space in this narrow galley style laundry room is used perfectly by adding closed storage and wall-mounted drying racks. While most of the space is cream and white, the black countertops pick up the octagon black and white tile flooring and pops of color are added with graphic artwork. Continue to 4 of 50 below. The focus in this laundry room is clearly on the bright red washer and dryer. The designers at Crystal Cabinets paired them with classic black cabinetry for a custom laundry room look. If you have a pair of basic white laundry appliances, why not paint them your favorite color? Learn how to custom paint a washer and dryer. Just a few cosmetic changes transform standard black cabinets into an entirely different look in a laundry room. The addition of graphic wallpaper and harlequin black and white flooring by Abbott Moon make this tiny space a designer's showplace. Continue to 6 of 50 below. The bright blue cabinets are the design star of this laundry room. Just a coat of paint can change the entire look of your space. Of course, the white farmhouse sink and contemporary stainless cabinet hardware don't hurt. Continue to 7 of 50 below. Traditional wood cabinets like these from Wellborn are the perfect backdrop for accessories to set the style in a laundry room. This room adds colorful artwork, greenery, extra task lighting and a stylish rug to set the mood. Continue to 8 of 50 below. A sink in the laundry room is nearly an essential for hand washing delicate items, presoaking really soiled clothes and treating stains. To prevent breaking up needed counter space, consider installing a corner sink. The square stainless hardware adds a bit of punch to the simple Shaker cabinets. The addition of glass front cabinets and wire storage bins gives this laundry area an industrial look. The added accessories like hanging hooks and storage baskets are both functional and attractive. Continue to 10 of 50 below. No need to give up your modern washer and dryer to have a laundry room with a retro feel. The black and white checkerboard tile trim, bright yellow wall color and accessories give this room a 1950s style. Continue to 11 of 50 below. What this basic white laundry room from Divine Custom Homes may lack in lots of decorative touches, it more than makes up with functional components. The stacked washer and dryer save precious floor space, closed storage cabinets and open shelving are abundant, the big sink will always be useful. But one of the best elements are the rolling laundry carts with an under-counter storage spot. Those carts can pick up dirty laundry from around the house and return the freshly washed clothes. Continue to 12 of 50 below. This laundry room featuring Whirlpool appliances is located directly off a master bath and uses colors that tie the two together. But the most striking feature is the choice of flooring. In addition to the natural slate, the designer added a band of river rock tiles that makes the entire space pop. The design star in this laundry room is the natural stone floor. The stone is easy to care for and adds a luxury touch to the basic cabinetry and layout of the room. Continue to 14 of 50 below. Photographer Holger Obenaus captured the sea and the lush colors foliage in this Kiawah Island laundry room floor. With just two colors of ceramic tile laid in a herringbone pattern, the laundry room floor becomes a focal point. Continue to 15 of 50 below. The wall treatments in this laundry room by Perkinson Homes are the star of the show. The mosaic tile backsplash makes a durable and beautiful statement. The added paint treatment adds color and visual interest. The illusion of height is created by treating the soffit near the ceiling with the same color as the walls. The same look could have been done with wallpaper. Continue to 16 of 50 below. Wallpaper is the perfect way to add some flair to a laundry room. Whether you choose to do the entire room or just an accent wall, the wallpaper can express your style. Since most laundry rooms are small, the cost can be minimal and with today's peel and stick papers, installation is a breeze. The designers at Litchfield Cabinetry created a modern laundry with a country style by combining unique shelving, shiplap walls, a free-standing sink, and some tin storage pieces that harken back to the days of vintage laundries. Continue to 18 of 50 below. This laundry wall from GE Appliances is sleek, modern and beautifully done. The simple design is enhanced with a glass mosaic backsplash, a seagrass rug, rolling hanging rack and simple accessories including a matching ironing board cover. One of the critical elements that make it perfect for laundry chores is the task lighting. Strong lighting helps in checking for and treating stains. Continue to 19 of 50 below. Adding a pet washing station like this one designed by Canyon Creek is a perfect element in the laundry room. The surfaces can withstand the splashing water and the laundry room is often near a back entrance area. An added benefit is that the washing station can be used to rinse off muddy shoes and hold a soaking tub for heavily stained garments. Continue to 20 of 50 below. This laundry room from Harrison Design has lots going for it with its shiplap walls, designated basket storage, farm sink, hanging rod and counter workspace. It also has a great spot for Rover's bed. Just remember that laundry rooms harbor some dangerous elements that can harm pets and make every effort to keep them safe. If your laundry room is also used for pet care, why not add a bit of style like this cabinet door with a cat silhouette cut out from Brickmoon Design? The opening is perfect to conceal a litter box or act as a sleeping hideaway. Just use a stencil and a jigsaw to create a custom look. Continue to 22 of 50 below. 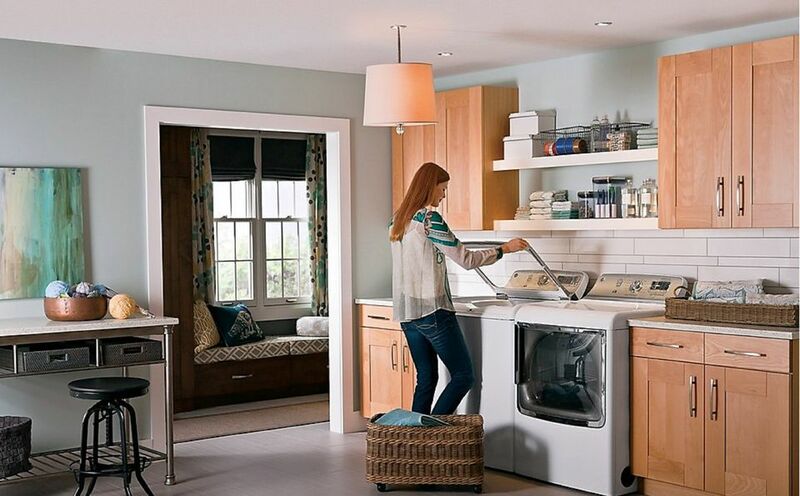 Stacking a washer and dryer is the perfect way to save floor space when planning a laundry, If you have a very small laundry room space or need to carve out a spot for laundry appliances in a kitchen or bath, stacking is a great option. Obviously, you must have a matching front load washer and dryer to make this work. Continue to 23 of 50 below. One of the latest design trends is barn doors. While they can be rustic or sleek, the key benefit of barn doors is that they slide out of the way on a track while remaining flush with the wall. This makes them perfect for a laundry in a high traffic hallway or entrance. In this design from Electrolux Appliances, the door hide a very small but functional laundry space. Continue to 24 of 50 below. Clearly, this laundry room is in a prominent place in this home. But the barn door design element from Geoff Chick & Associates makes it a focal point. These doors hide a single wall laundry layout with closed storage for supplies, a counter workspace and an easy-care floor for cleaning. Most homes don't have huge, perfectly designed laundry rooms. But that doesn't mean a small laundry space can't have style. Just take a look at this exquisitely tiled laundry closet from French Brothers Home. Tucked behind closet doors is everything you need - appliances, folding counter, closed storage and good lighting. This space is so beautiful, we might just remove the closet doors! Continue to 26 of 50 below. When a family gets home from work and school, a laundry/mud room is the perfect place to drop all the items that need to be cleaned and readied for the next outing. This area from Gunlock Homes in Denver offers all of the needed storage areas for shoes and sports equipment, hooks for coats and keys as well as laundry appliances and supplies. The addition of a wall clock will, hopefully, help get everyone out of the door on time. Continue to 27 of 50 below. This laundry/mud room by MS International Stone in Orange County, CA, creates the feel of the great outdoors by using a natural stone floor, expansive windows to showcase the gardens and a sky blue ceiling. Continue to 28 of 50 below. This space may be bigger than most apartments but it holds nearly everything a family needs - laundry appliances and laundry sink, organizational area for schedules and bookbags, water cooler, extra refrigerator and pantry storage space. There's even a red carpet to welcome everyone home. This laundry room from VanBrouck & Associates, a luxury residential design firm, is a combination laundry and craft room. It features exceptional light from the beautiful windows, storage for supplies and a comfortable workspace. Continue to 30 of 50 below. A basement laundry room does not have to be creepy. Add some bright colors, storage shelving and, most importantly, good lighting and the basement laundry can actually be inviting. This space is done with inexpensive premade cabinets and flooring and a dropped ceiling with recessed lighting. Continue to 31 of 50 below. If your basement has been transformed into a family room or even a room for the kids, there's no need to hide the laundry area. Create some storage, add appropriate lighting and work at keeping the area neat and clean and you'll have a spot for laundry that keeps you involved with the rest of the family. Who knows, you might even be able to teach a teenager to do their own laundry! Continue to 32 of 50 below. If you are creating a closet of your dreams including a crystal chandelier, why not add a washer and dryer. A stacked set like these from Electrolux take a small amount of floor space and adds convenience in putting clean clothes away. The addition of laundry appliances in a dressing area doesn't have to look so obvious. Terracotta Design Builders concealed the laundry appliances with stylish ventilated doors. The doors are attractive and also help to vent excess heat and moisture that could cause mold and mildew problems. Continue to 34 of 50 below. As more people move toward smaller homes including apartments and condos, the laundry room is often sacrificed. For anyone who has to make trips to a communal laundry room or laundromat, having a washer and dryer in their living space is fabulous. With careful planning like this one from Bosch Appliances, a washer and dryer can be accommodated without giving up much floor space. Continue to 35 of 50 below. These sleek contemporary cabinets hide a stacked washer and dryer in the kitchen/dining area. Perfect for urban living, the counter space and dining table can be used for folding. The nearby sink provides an additional spot for stain treatment and the other cabinets offer storage for detergents and cleaning products. Continue to 36 of 50 below. Laundry piles up for family and guests even on vacation. This laundry room/kitchen from Hammond Design Group was developed for a small vacation home. The counter serves as workspace and the installation was simple thanks to nearby water supply lines. On the islands of Hawaii, space is often at a premium in homes. Archipelago Hawaii, a luxury design firm, created this contemporary sleek bathroom design that has a washer and dryer beautifully tucked away. The bathroom is actually a perfect spot to locate laundry appliances because water lines are already in place. The work shelf is perfect for folding and holding supplies. Continue to 38 of 50 below. XTC Design Incorporated is an award-winning Toronto interior design company specializing in kitchen and bathroom design. This layout shows how an attractive and functional laundry room space can be incorporated into a bathroom. Continue to 39 of 50 below. If your laundry room is located next to an outside entrance door, you can spread that natural light into your living space by adding a French door to the laundry room. Since the space probably works as a small entryway/mud room, add organizational hooks for coats and bookbags. Continue to 40 of 50 below. The addition of a desk level workspace turns this basic laundry room into a place to do crafts or homework or even a quiet space to hide from the family! The counter is also the perfect height for folding clothes while seated; an excellent choice for anyone doing laundry tasks with limited mobility. A sink in the laundry room is nearly an essential component. The sink is perfect for presoaking stained clothes, hand washing delicate items and handling all the especially dirty tasks around the house. Sink styles range from industrial to beautiful. If they don't have a custom cabinet, add a fabric skirt like this one from Phoebe Howard. The fabric adds color, style and a spot to hide some supplies underneath. Continue to 42 of 50 below. This basement laundry space transformation by The Design Den incorporates bright, contemporary features including a stainless steel countertop and shelf. Stainless steel is an excellent choice because it can withstand any accidental spills from cleaning products and is easy to clean. Continue to 43 of 50 below. Laundry is not everyone's favorite chore so why not add art and accessories that make you smile? These frames seashells can take your mind back to a favorite beach trip and off the piles of dirty laundry. This room includes inexpensive shelving for storing supplies and a counter over the machines as a stain-treating workspace and folding station. Continue to 44 of 50 below. The royal blue cabinets paired with crisp white touches create a contemporary style in this laundry space from Transformhome.com. The addition of a few personal touches like a favorite photograph and some succulents complete the look while still leaving plenty of space for laundry tasks. Whether your laundry area is part of an entryway mud room or tucked away in another spot, this phone and electronics charging station from MRF Construction is a great idea. If you can't afford a custom built-in station, a portable one is still a good idea. The electronics can provide apps with helpful laundry information and provide entertainment to make laundry tasks a bit more pleasant. Continue to 46 of 50 below. Custom cabinetry is great for stashing all of our laundry supplies and work progress out of sight. But it is also quite expensive. The designers at Lucy Interior Design solved the cost issues by installing a curtain rod and using a curtain to hide the space above the washer and dryer. The space also includes a hanging rod for clothes and keeps detergent and essentials right at your fingertips. Continue to 47 of 50 below. No one wants to see what's in a trash can or a dirty laundry hamper all the time. The designers at Chabot Interiors in Toronto solved the problem with these pull-out drawers with removable laundry hampers. The hampers provide easy sorting of white and dark clothes to speed up laundry day. These storage drawers pull out but there are also tilt-out models available. Continue to 48 of 50 below. If you can't hide away laundry baskets, create a custom storage space. These shelves from Carolina Closets Plus are spaced to fit a standard laundry basket and pull out for easy access. Don't forget to label them so your family can do a better job at helping with laundry! With so many fabrics that need to be air dried to avoid the excessively high heat of tumble dryers, a drying rack is almost a necessity in the laundry room. Floor models work well but take up lots of space. Built-in wall mounted racks that fold out of the way like this design from Weaver Custom Homes work beautifully. The racks can even be mounted a bit higher and used as a hanging rack for clothes fresh out of the dryer. Continue to 50 of 50 below. An ironing board is essential in most laundry rooms. A standard board takes up lots of storage space and floor space when in use. The designers at Transformhome.com included this built-in ironing board in a laundry room that slides away when not in use. Convenient. Functional. Clean Lines.